Put dry oats and water in a microwave safe bowl. Cook for 1 and a half minutes. Remove from microwave (carefully! it’s hot) and top with PB2, Barleans, and Chocolate Stevita. Add desired amount of almond milk- use less if you like thicker oatmeal. Top with bananas and blueberries, enjoy! Melt in your favorite chocolate bar, top with peanuts and raisins, top with coconut and dates, etc! Start by lining a freezer safe bowl or container with parchment paper. Slowly melt the chocolate at 50% power, stirring often (1 minute, then 30 seconds at a time until it’s melted). Or you may use the “Melt” feature if your microwave has it. In a separate large bowl, mix all the remaining ingredients. Pour chocolate over and mix well. It will turn into a dryer crumble texture. Push into your parchment paper lined container. Freeze until hard (if you can wait that long). After about an hour, I chop/break mine up and store it in a ziploc bag/container in the freezer. 1) STOP EATING BEFORE FULL- Only eat to 80% full, it’s hard to do, but it’s great for digestion and weight control. 2) Eat your smallest meal later in the day. Try to eat your largest meal for breakfast or lunch, when you still have time to burn energy. 3) No more than four ounces red meat once per week. For many centenarian cultures they don’t eat a lot of meat. After all of the Holiday treats, it’s easy to say “No more carbs” or “I need to lose 5 pounds.” In reality, it’s not that easy. After all of the salt, fat, and sugars have flooded our bodies, our brains want more. We crave more. These cookies are perfect for weaning yourself off of the holiday fare and setting yourself up for New Year’s Resolutions and happy, healthy bodies. 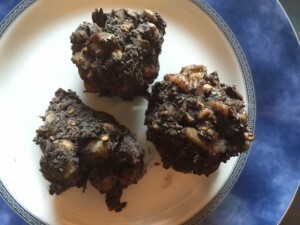 Despite being absolutely decadent, these cookies are clean, low carb, and high fat, so they satiate your brain without spiking your blood sugar. Oh, and did I mention, they take ten minutes from start to mouth! First of all, all of my measures are approximate, please adjust the walnuts and coconut to your desired chunky texture. In a large bowl, mix the cocoa and stevia. In a separate microwaveable bowl or mug, combine the coconut oil and peanut butter. Microwave on 70% Power for 2 minutes. 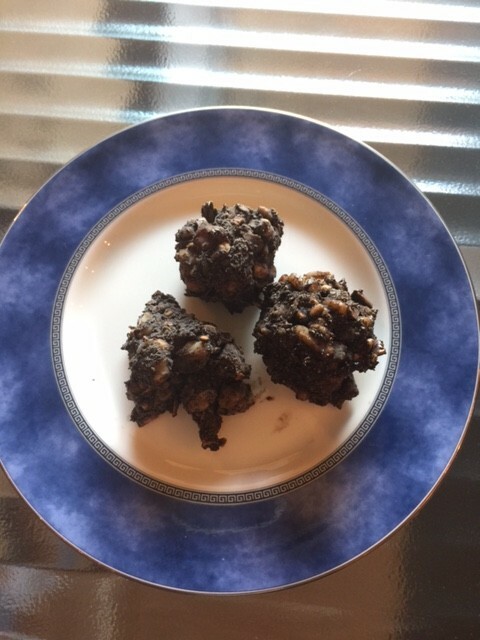 While that is in the microwave, add your walnuts and flaked coconut into the large bowl with chocolate and stevia. Pour the peanut butter/coconut mixture into large bowl with all other ingredients. Stir to mix everything well. At this point I choose to be messy and grab a handful and mold into my desired cookie shape then place on the pan with parchment paper. If you’d like, you may try to do this with a spoon, but WARNING, it’s not as fun. After molding all of your cookies, place the pan into the freezer and freeze for at least ten minutes before eating. Or freeze up to an hour, then transfer into a container or freezer bag. I would think you can store these for up to a month, but ours never survive past a few days.